Ericsson’s numbers for the first quarter of 2017 featured a massive set of write-downs as the company looked to get as much financial bad news out in the open as possible. 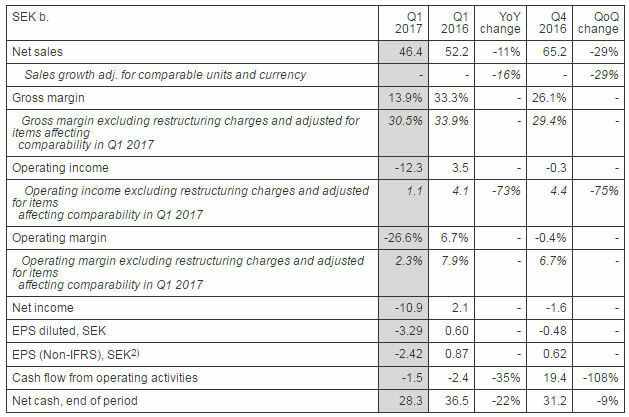 The SEK 13.4 billion (~$1.5 billion) of assorted write-downs and restructuring charges had been forewarned in the recent Ericsson strategy update, but it still makes for ugly reading in the cold light of year-on-year comparisons. Net income for the quarter was SEK -10.9 billion, which is clearly unsustainable. And the grim news isn’t restricted to the write-downs; revenues were down 16% YoY when adjusted for comparable currency. 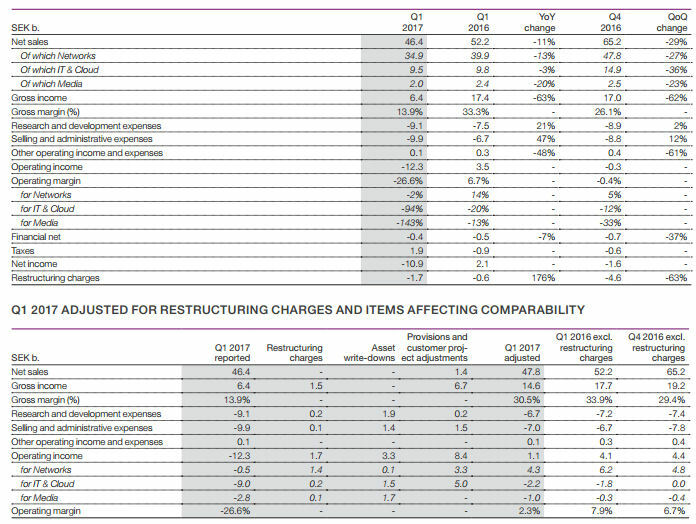 As you can see in the first table below, even when you take out the exceptional items the YoY operating income comparison isn’t favourable. Furthermore, unannounced in the strategy update is the fresh revelation that sales are expected to be negatively affected to the tune of SEK 10 billion over the next couple of years by stripping out unprofitable contracts in Managed Services and Network Roll-out. “Our performance in the first quarter continued to be unsatisfactory,” said CEO Börje Ekholm. “Segment Networks delivered a solid result despite lower sales, while losses in segments IT & Cloud and Media increased significantly. In the quarter a more focused business strategy and a new Executive Team were announced. The immediate priority is to improve profitability while also taking action to revitalize technology and market leadership. “Of the total adjustments of SEK -13.4 b., write-downs were SEK -3.3 b. and restructuring charges were SEK -1.7 b. Triggered by negative developments late in the quarter related to certain customer contracts, provisions and adjustments of SEK -8.4 b. were made of which SEK 5.8 b. is estimated to negatively affect cash flow over several years. You can see how all those adjustments were allocated across the business segments in the bottom table below. The asset write-downs came almost entirely from the troubled IT & Cloud and Media divisions and, as Ekholm said, IT & Cloud also accounted for the bulk of the adjustments, but the revenue and expenses adjustments seem to have come from Networks. Ericsson’s shares don’t seem to have been badly hit by these numbers – it lost a pre-earnings spike but that’s about it. It’s sensible for Ekholm to want to get all the financial bad news out in one quarter, to draw a line under the previous regime and hopefully be able to report more positive trends in future. But the fact that he’s even having to make negative adjustments for the Networks division and that there’s still a bunch of negative revenue news to come shows it’s not as easy to contain the bad news as he would have liked.